Throw pillows add personality, texture, and–on a practical level–a place to rest your head while you’re binge-watching Netflix. But finding colors and patterns that work with your décor and are also within your price range can be a challenge—inevitably your favorites will always be the most expensive, right? Instead of spending money on a pillow that you only feel so-so about why not make your own? 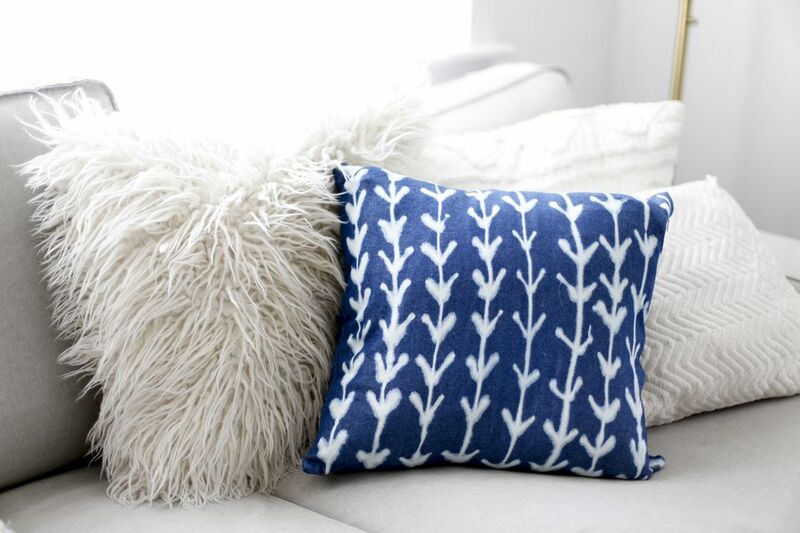 It’s easier than you think to customize a plain pillowcase into something that looks like it came from your favorite home store. It’s really important to make sure the fabric in the pillowcase is cotton, or at least not synthetic for this specific technique. If you’re uncertain how the bleach will affect the cloth, do a small test spot on a back corner of the pillowcase where no one will see it. Synthetic fibers won’t absorb the bleach and your design won't really show up; using a natural fiber will yield better results. A bleach pen also offers you more control over the types of patterns you can create on the surface thanks to its pointed tip. While no one (or very few people) like to iron, you’ll want the pillowcase to be as smooth and flat as possible so you can apply your bleach pattern evenly. Use a hot iron and/or a steamer to really make sure all of the creases are smoothed out. If you really hate ironing, at least know that ironing this pillowcase will be way easier than ironing a pair of pants. As always, before you even think about touching the bleach pen to your pillowcase, you’ll want to figure out a plan for your pillow. You don’t have to use this pattern, but you will want to come up with your design before you get started. You also might need to measure or tape off sections depending on the pattern you create. Don’t focus too much on having it look perfect–the beauty of this project is that it’s supposed to look a little faded, blurred, and imperfect. Sketch out your pattern using a marker on a piece of brown paper bag, a piece of construction paper, or a scrap of fabric. The sky is really the limit when you’re customizing a pillowcase. You can use iron-on fabric pieces, add a pom-pom fringe, or even dip dye a plain pillowcase to create a spectacular set of pillows for your sofa. In a well-ventilated area, get started drawing on your pattern with the bleach pen. Work slowly and carefully–trying to rush will only end up spreading the bleach or adding little marks that you might not want. Depending on which hand you use, move across the pillowcase so that you don’t run the risk of resting your hand on the wet bleach as you’re working. Periodically stop and check your pattern. Know that the bleach line will be thicker than you think at first because the bleach will seep into the fabric and spread. The cool thing about the bleach pen? The unexpected results. Depending on the fabric you use and the color of the pillowcase, you can get very different results with how the bleach pulls the color out of the fabric. Let the bleach sit until you can see that the color has been removed from the fabric, then rinse thoroughly. Until the bleach has fully seeped into the fabric, the design isn’t fully set. Don’t fold the pillowcase or place an insert inside of it yet either. Before placing the pillowcase on your couch, wash according to the instructions on the label and dry completely. You can hang your pillowcase somewhere cool, dark, and safe to dry overnight or put it in the dryer. If you’re worried about using detergent, you can just rinse the pillowcase thoroughly to ensure that all of the bleach is removed. Repeat until you have all of the pillows that you need. And get creative! Try different lines, dots, squiggles, and shapes on different pillows. Varying the colors of your pillowcases also yields interesting results when bleach is added. Depending on what you choose, you can easily create a pattern that looks dyed, even though it's much easier than a Shibori DIY. Just be patient and take your time as you're working. 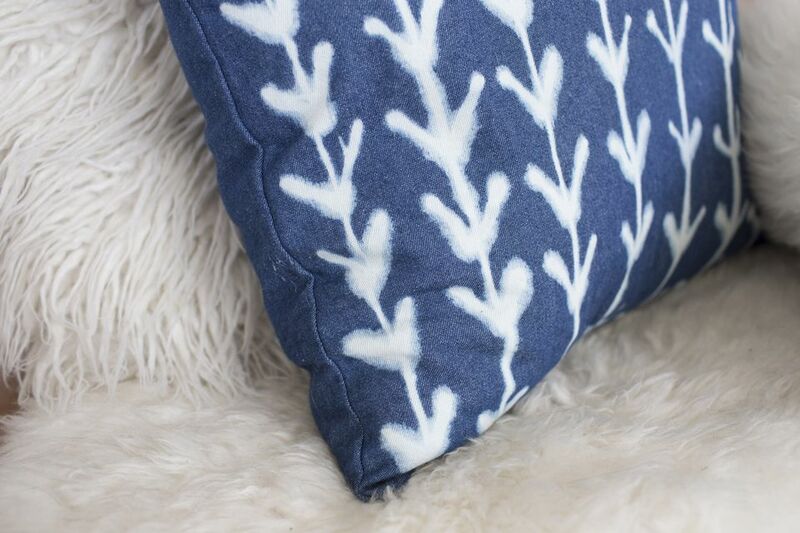 These can be as simple or as involved as you’d like, but really they’re a much more affordable way to update the look of the pillows in your home!